The fissure detector depends for its operation upon the fact that electric current flowing through a rail is compelled to pass around any fracture, inclusion, or separation in the metal. When a rail is sound the axis of current is substantially straight, but if a fissure is encountered, the current axis at that point is displaced. An inductive pick-up device is mounted directly over the rail head, where it cuts the magnetic lines of force surrounding the rail. 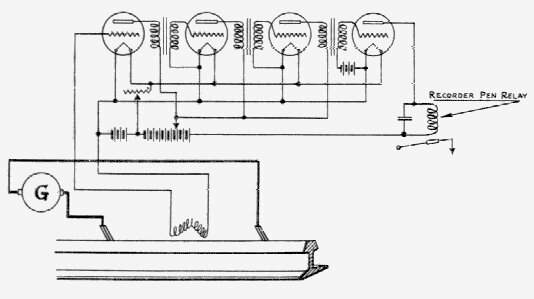 In the case of a sound rail carrying current, the magnetic flux surrounding the rail is uniform and no Electro Magnetic Flux ( e.m.f. ) is generated as the inductive pick-up passes along, but when the axis of current is deflected, as at a fissure, the flux density around the rail varies, resulting in a generated potential at the terminals of the pickup. This output from the pick-up is amplified and led through relays connected to recorder pens, thus giving a record of the received impulse.